This letter written by Chiang Wei-Kuo, son of Chiang Kai-shek. It bears the official seal of Chiang. 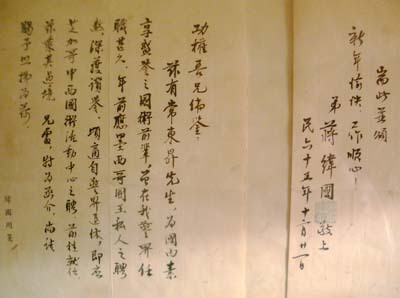 The documents states Chang was prominent for being a senior in the field of Chinese Kong-Fu in this country and had worked as policeman for a long time. It also mentions Master Chang was hired privately by the King of Mexico for teaching his kung fu in that country.